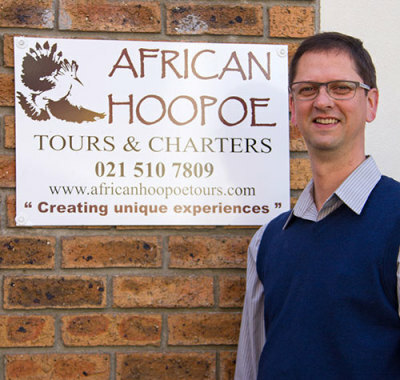 Welcome to African Hoopoe Tours and thank you for taking the time to read through our company profile. In 1996, Marius du Plessis made a career change and started working at a medium sized tour company in Meadow Ridge, Cape Town. He qualified as a tour guide and was soon on his way to become a top guide. A year later he joined a big tour operator specialising in day tours and charters. It has always been his dream of running his own business and in 2007 he purchased his first touring vehicle, a Mercedes Vito while still guiding full time. Renting his vehicle to the movie industry he realised the potential, so in 2010 he went on his own, and what a year it would prove to be with the 2010 FIFA World Cup being hosted in Cape Town. The next big step came when he purchased two more vehicles and started creating a corporate identity. 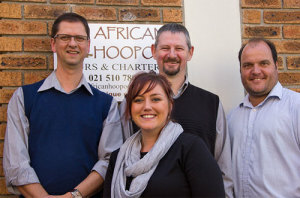 He was joined by Warren Walker in 2012 who pioneered the office automation and our first website. 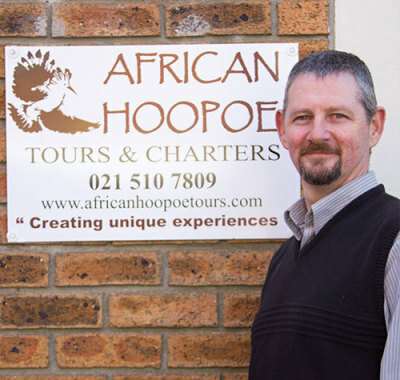 During this period his brother, Andre du Plessis also assisted him greatly with the running of his business and eventually qualified and became a respected tourist guide. 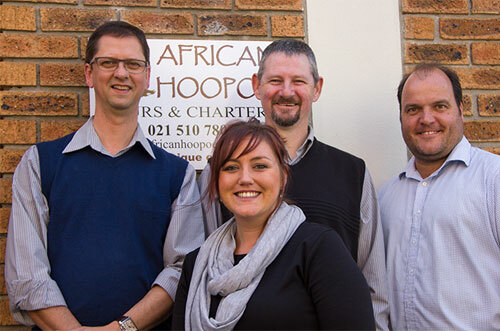 The latest addition to the growing African Hoopoe Tours family is Rolinda Schultz, adding a much needed marketing string to our bow. She has completed her studies in marketing and tourism and with her positive energy is a huge asset to us all. Lastly but not least, our many drivers we sub contract completes the team. We are a small tour operator with big enough capacity to handle from medium to large groups. You should say we are a family run business with great values ready to enrich the lives of tourist and industry partners alike. Enriching lives by creating unique experiences. Our focus is on the experience we give our clients and we feel it is unique. What makes it unique to tour with us is our approach to tours, as a strong emphasis is placed on the individual traveller and how we can adapt a tour to be both meaningful and adding value to the individual’s life. A lot of effort goes into planning itineraries here in South Africa and Namibia we have a stringent quality control process whereby we get feedback from clients allowing us to better our services. It also is our passion to cater for people with handicaps enabling them to also enjoy touring with us. Whether this means touring the Cape peninsula in a side car to enjoy the freedom of the road next to a motorbike or whether going on safari in Namibia in one of our specially modified vehicles capable of accommodating wheelchairs. After completing a tour with us you would agree that no effort was saved in bringing you indeed an enriching and unique experience that will stay with you for a very long time. We offer from day tours to overland packages. Day tours are tours which can include from wine tasting and peninsula tours to shark cage diving at Gansbay. We teamed up with industry experts to provide action filled tours for those adrenalin junkies or the milder cycle tours. Team building tours are also arranged as day tours whether it’s kayaking, zip lining or sand boarding and the list has no end. Overland tours can be from 4 days to 16 days. The garden route is very popular amongst travellers offering great diversity in scenery from the dry Karoo to the Afro montane forests of Knysna. We also excel in safaris both here in South Africa and in Namibia and Botswana. We have a network of service providers in these regions able to exceed your expectations. Motorbike tours are our passion whether on or off road. Our beautiful country lends itself to this activity from our open tarred roads with sweeping mountain passes to the dirt roads leading to hidden valleys waiting to be discovered. We rent our motorbikes and full kits from a reliable supplier highly respected in the industry. With a back up vehicle making sure you have a reliable back up but also to transport drinks and snacks to be enjoyed when we stop to re-group. So whether you like the off road experience or the Harley Davidson experience we can be of service to you. Our fleet of vehicles ranges from an off road BMW GS1200 to a BMW sedan, 7 seated Mercedes Vito and a 16 seated Mercedes Sprinter. All our vehicles comply with government regulation applicable to all passenger vehicles. We also have liability cover on all of our vehicles and should we need to sub-hire a vehicle we ensure that the particular vehicle is also covered. Our vehicles are well maintained and undergo its yearly road worthy test ensuring safety. We only make use of guides who have a passion for the industry and share our vision of enriching lives and who wants to create something unique for our guests. This means keeping up with new trends and information. All of our guides have done a first aid course and have got a professional drivers permit. Our drivers alike are passionate about their job and also get rated after each tour so we can see where we can improve as a team.